Okay, I’ll admit it. I’m coveting. My little neighborhood has a civic league which awards the honor of “Best Yard of the Month” to a deserving home. That yard even gets a sign that proclaims the award to anyone passing by, including those of us losers who have a mediocre front yard. The people who get this award have worked hard on planning and planting and deserve the recognition. Our little courtyard in back is quite nice, especially in the spring and early summer when the roses and lilies are in bloom, and the Carolina jasmine is flowering, but, admittedly, other than mowing my postage-stamp-sized yard, I haven’t done anything in the front to deserve notice. I decided to do something about this recently. A couple of weeks ago, my brother-in-law and sister-in-law from Florida visited, and we took them to the Norfolk Botanical Gardens where I was able to get some ideas to make my yard look good enough to get that sign. It took some work, but I wanted to show you the before and after pictures and get your opinion. This is me, admiring my handiwork. That sign is about to be mine! Are you buying any of this? This entry was posted in Just Blogging and tagged Gardening, Gardens, home, humor, life, personal, Thou shalt not take the name of the Lord thy God in vain, women. Bookmark the permalink. You really had me going!! I couldn’t wait to see what you’d done with your yard…I laughed out loud. Thanks! And all it took was a little elbow grease and some imagination! Good job! Oh forget Best Yard of the Month. 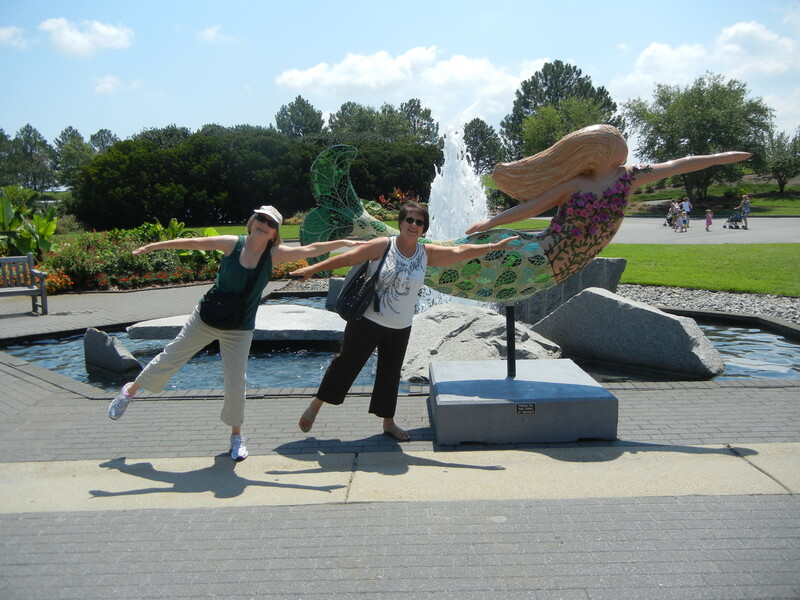 How many of those winners would synchronize swim with a mermaid sculpture? And let someone take a picture of it? Unless those gardeners are doing begonia impressions while they weed, you win in my book. You have discriminating tastes, Amy, and you are so right. We’re getting a riding mower because now the cord on our little electric mower won’t reach far enough. You know you had me for a minute. No really I’m kinda slow. Love the new look of it all Susan. Could you please come do my yard? Its in terrible need of a makeover. speaking of makeovers I’d love it if you’d visit my new blog http://www.picsprayerspomspoms.blogspot.com. I’d really like your oppinion. Julie, I just nominated you for an award. Sorry! You can read about it on my site. If you’re to busy to respond, don’t worry about it. Wow, I can’t even keep up with my one blog, and now you have a second! I’m impressed. I’m going to check your new one out right away. I love the yards! Not having or even thinking I might want a green thumb, I do not even think about having my own gorgeous yard, but still appreciate a great lawn/garden. Good luck with your grand plans–just remember to have fun. Rather planting flowers–although i would love to have them to cut/trim and bring into the house–I think I would put my time into starting my own awards or just making my own signs: Best Back Yard Ever! or Best Moonlight Dance Space! or Serenity Found Here! Serenity Found Here! Love it, Patti! Amazing how different a house and yard can look when you remove the blue ADT sign! That comment had my husband and me hooting, Margie. It was funnier than my whole post! 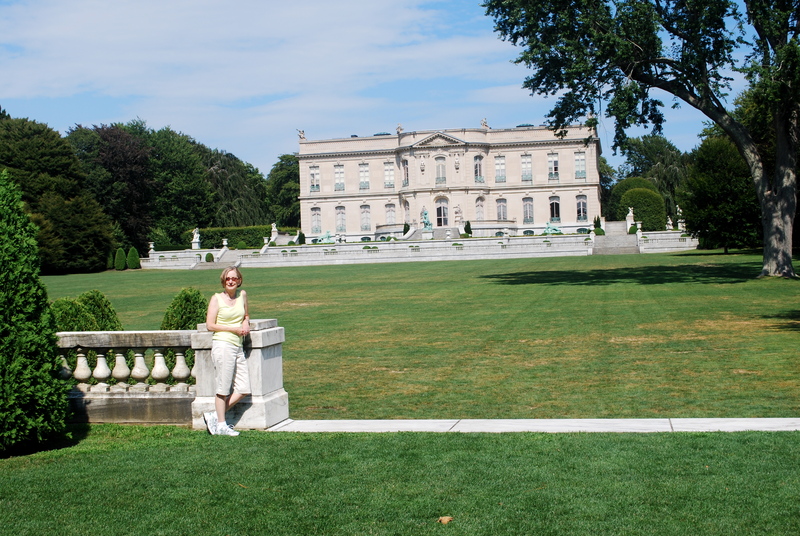 Thanks for the compliment, but the photo of your house and then the mansion in Newport were much funnier! As always nice post. Thanks. You just had to show that to me, didn’t you, Judith? Now I want topiaries in my yard, too. Isn’t it amazing how a little landscaping can absolutely transform a house?? 😉 Big huge wink here!! Seriously, I’m not good in the plants department either, that’s why I leave it all up to my husband. Funny because I’m the one who grew up in the country and he’s the city boy who didn’t even have grass at his house. 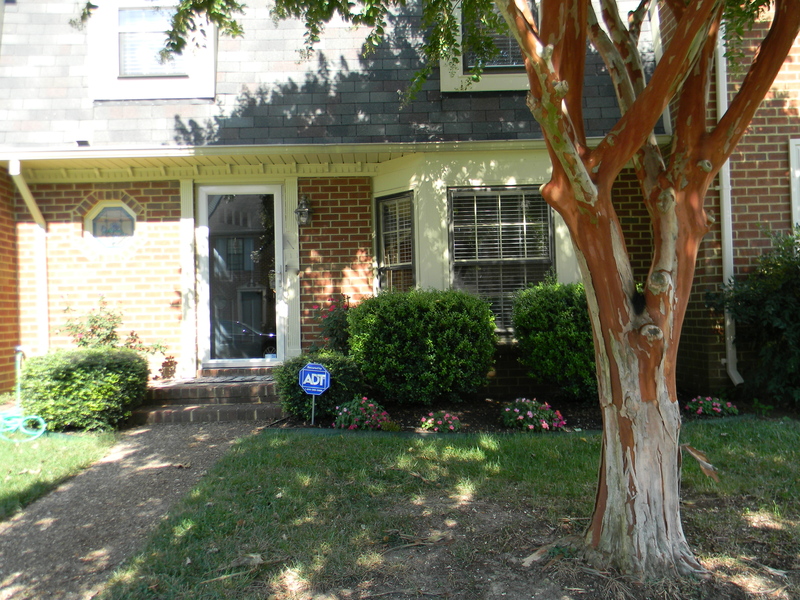 (No lie – bricked back yard, front door opened to stoop, steps, sidewalk, street.) Go figure. Maybe it’s because he grew up without plants, he’s determined to enjoy them now. Just you wait—I’m going to do a great job of landscaping next spring. Okay, maybe just a good job. But I’ll send pictures. There’s got to be a blog post in there somewhere. That’s exactly it! He loves digging in the dirt, planting flowers and vegetables, shrubs, trees, whatever. He even enjoys mowing our 2 1/4 acre yard — on a riding mower tractor of course. Somewhere inside of that city boy was a farmer trying to get out, I think. Or maybe he thinks he’s “playing farmer.” 😉 Either way, I’m letting him enjoy his fun! It actually works out perfectly for both of you! That is sooooo funny! Plants are my downfall. I even had a plastic plant that died. True. It began losing it’s big leaves, one by one! Your front yard is actually lovely the way it is! Stop coveting. Maybe I should populate my front yard with plastic plants, though after your experience, I might now have any success with those, either. Thanks, Dor. My neighborhood doesn’t have a “yard of the month” or I’m sure I’d want to win it, too. I wish I actually knew what I was doing when I plant things. I have no plan, no vision, other than, “Hey, that plant is pretty. Think I’ll plop it into the ground.” That could be why I haven’t won yet. Thou shalt not covet is an appropriate title for this piece. No, I’m not buying! You should see the yards of the winners. My little yard needs so much work. If mypajamadays were here, she’d make it look spectacular. I can’t even get grass to grow under that old crepe myrtle. In my defense, we’ve only owned this place for two years and did most of the work in our courtyard where we spend our time. Next spring I’ll start working on the front. Ha! Love it. My, what a fine job you did, too. Must have been a lot of back-breaking work. Can I offer you a job up here to work on mine? Absolutely, Darla. Julia from wordsxo.com lives in Maine and wants me to come, too, so I’ll get to meet you both and transform your lawns at the same time. No question you earned the sign…. as well as a free ticket to Maine if you can help me transform my house, too! I’m envious of the “best yard of the month award” and we don’t even live in your neighborhood (not that I’d earn it with the weeds on steroids we have right now). p.s. love the cute photo of you & your sister in law at the gardens!! The after photo was really taken at Newport. I think that house was the Elms. Next spring I’m going to do something about that front yard of ours and earn that sign for real. What part of Maine do you live in? Admittedly, I need to put in some flowers to give it more color. We might need to purchase a riding lawn mower. The cord on our electric one won’t reach.